In contrast to Uganda, Zambia, Tanzania and Kenya the housing policies of Malawi were considered successfull until the early 1990s. The author explores paradigms, legal framework requirements, institutional set-ups and approaches in Malawi since independence and discusses differences and similarities within anglophone Southeast Africa. 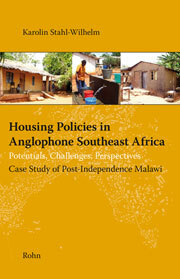 She describes the reasons for the former success and the current challenges of Malawi to achieve demand-driven housing. Internationally proclaimed housing approaches seem to be far less effective than traditional modes of housing supply. Karolin Stahl-Wilhelm | After graduating from Berlin University of Technology in 2004, Karolin Stahl-Wilhelm worked as urban planner in Berlin, Arequipa (Peru) and Zomba (Malawi). She was responsible for the review of urban planning and development guidelines and capacity development at regional and local authority level. She supported local and regional governments in physical planning, participation procedures, land management processes and economic development strategies. Stahl-Wilhelm conducted research projects about informal settlement development and colonial urbanism in Venezuela and Malawi. She was affiliated with the University of Malawi as researcher and teacher with the focus on spatial results of planning processes.